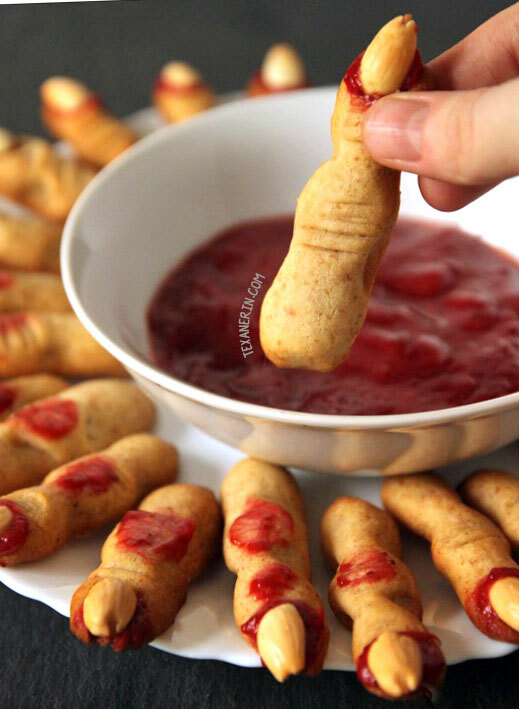 These healthier witch finger cookies use jam in place of food coloring! Can be made with all-purpose flour or with whole wheat for a 100% whole grain version. 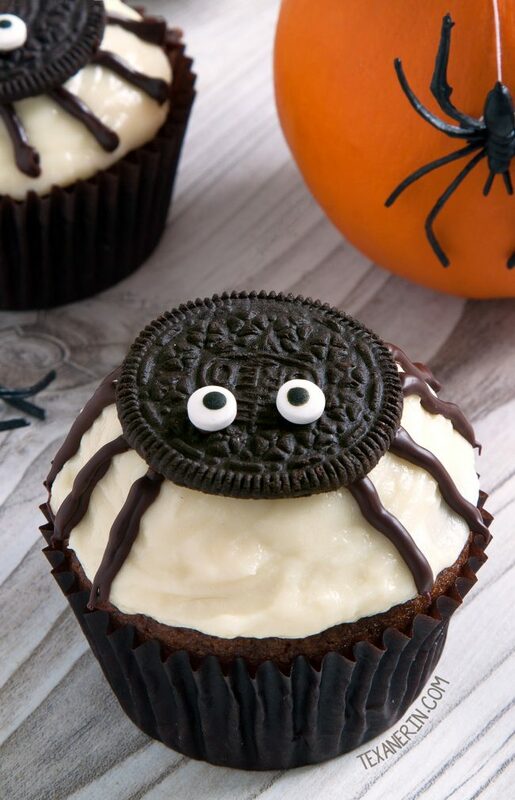 The perfect Halloween dessert! 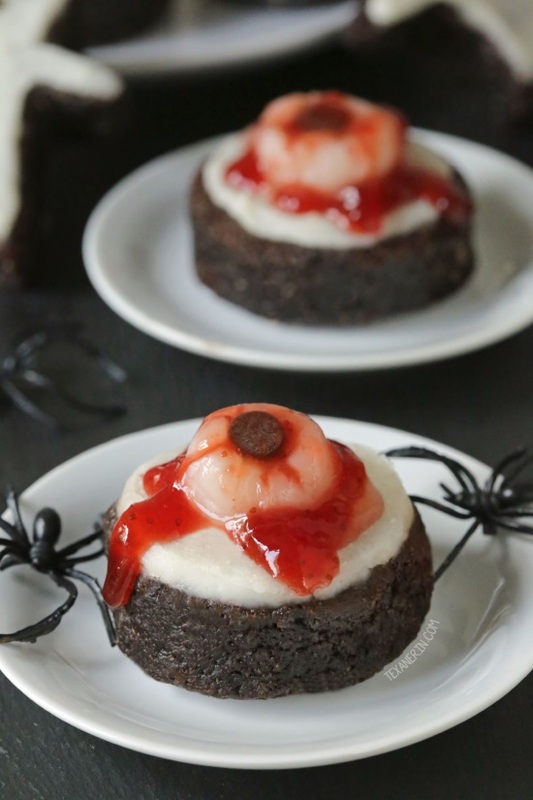 I’ve been struggling with coming up with Halloween desserts that are totally free of processed food so I was ridiculously happy to have come across these! All of the witch finger cookies I found use red decorating gel. Food coloring doesn’t normally bother me (I know it should) but the thought of eating red decorating gel makes me queasy. So here we have some awesome strawberry jam. And it complements the almond flavor perfectly. To be honest, I think these shortbread cookies are kind of boring tasting without the jam. And I’m not a crunchy cookie kind of girl. I think out of all my cookie recipes, only 2-3 aren’t soft and chewy. Strawberry jam helps a lot. Raspberry jam would also be great but for the blood effect, I think strawberry is better. 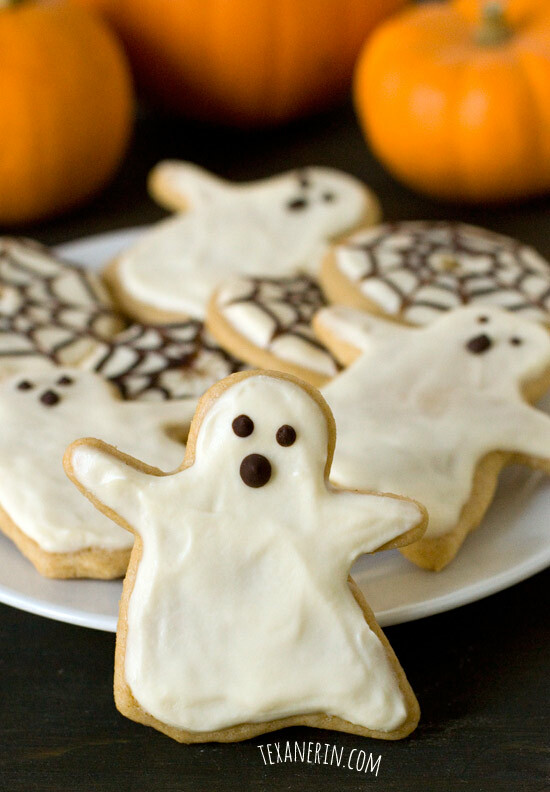 For lots more healthier Halloween recipes, check out my post on 50 Healthy Halloween Recipes. So many fun ideas there! If you don’t have white whole wheat flour, you could use all-purpose flour in these witch finger cookies. I’m guessing whole spelt would also work well! You may need to add a tiny bit of extra flour if the dough is extra sticky. 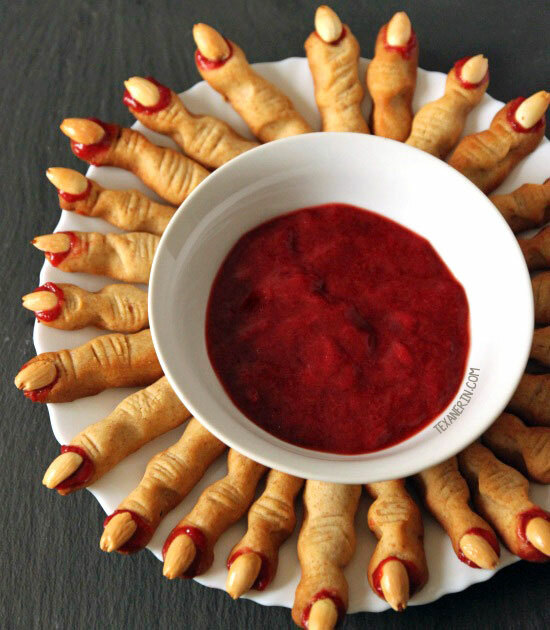 So what kind of desserts are you making for Halloween? I’m bummed I’m just now getting on the Halloween bandwagon. 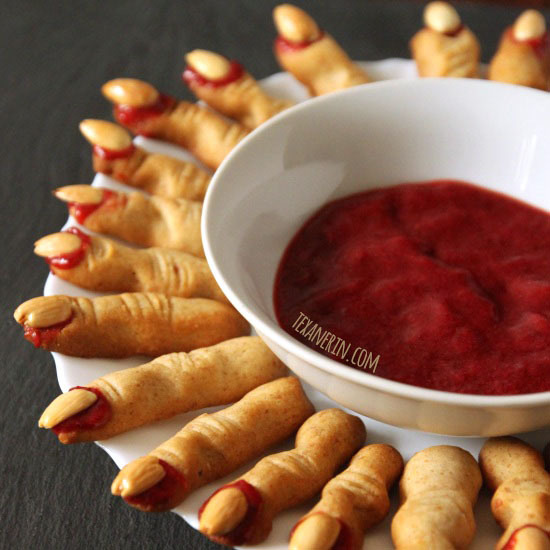 These bloody witch finger cookies are so fun! For a fun healthy Halloween drink (also without food coloring! ), try this kiwi spritzer Halloween drink from Wonky Wonderful! 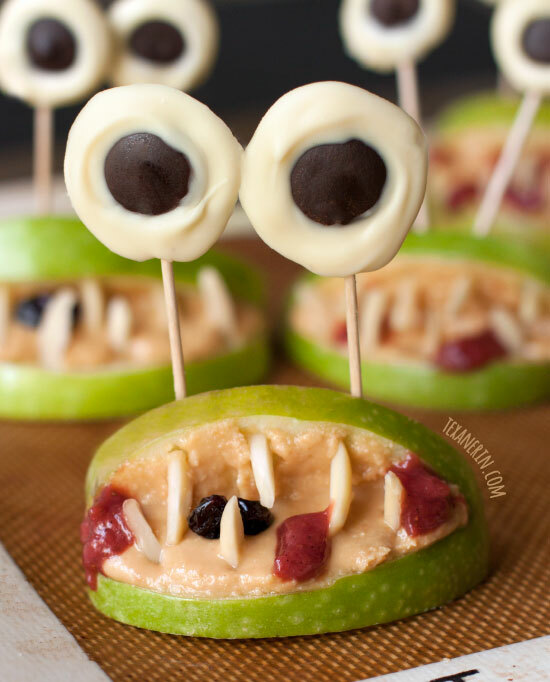 Looking for more healthier Halloween desserts? Beat the butter and sugar together until fluffy. Add the egg, almond extract, and vanilla extract and mix. When well combined, add the flour and salt. When thoroughly combined, cover with plastic wrap and refrigerate for 40 minutes. Preheat your oven to 325°F (165°C). Take about a fourth of the dough out of the fridge and begin rolling out the fingers. I rolled them out the size of my pinky, both in length and thickness. Add an almond to the tip for the fingernail and press down to make sure it's secure. Form a knuckle by squeezing (see the picture above!) and then use a knife to make some creases. Place on a Silpat on a cookie sheet (or just a cookie sheet), leaving about a centimeter between them. Repeat with the rest of the dough until the cookie sheet is full. Bake for 17 - 22 minutes or until slightly golden. Let the cookies cool, and then remove the almonds from the cookies. Add some jam in the cavities and then put the almonds back, making sure you used enough jam for them to ooze a little. Also add some jam around knuckles for extra nastiness. I used about 1/2 cup jam and used the rest as "dip." You need 2 2/3 cups of flour total. You can see my comment about this here. If you live in Germany, you need to use half Type 550 for the all-purpose flour and half Type 405 (which is the normal kind you find everywhere). You can get Type 550 at any non-discounter. For the almond extract, I used two vials of Bittermandel Backaroma. 52 comments on “Witch Finger Cookies (without food coloring! )” — Add one! 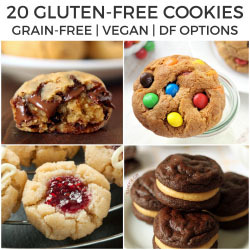 Have you tried making these gluten free? I’m wondering if I could substitute gluten free all purpose flour or almond flour. Any thoughts? I’m so sorry for just now seeing your question! I’m probably too late now but for anyone else wondering, almond flour won’t work but a GF 1-to-1 flour might. But I’m really not sure since I haven’t tried it. Sorry again! These didn’t work out for me, they all came out completely thin & flat. I’m not sure what I did wrong. In the recipe it lists 1 1/3 cup of flour twice, so was it supposed to be 2 2/3 cups of flour total? I assumed it was accidentally listed twice, so only did the 1 1/3 cups. Is that where I messed up? Hello! The recipe is correct, so that’s indeed where you went wrong. You can see my comment about the flour in this comment. I’m sorry about that! I’m not sure of how else to list it to divide it up properly. I’m going to bake some today. Can I put the jam on and then the almond nail before I bake them? Thanks! It’s been a long time since I posted these but I think I tested out both versions (putting on the jam before and after baking) and they looked nicer when you add the jam afterwards. Hope you’ll enjoy the cookies! Love these! So cute and creepy. Hi,can i use unsalted,salted or sweet butter? I used unsalted but any kind will work fine! These devilish digits are so finger licking good. Thanks so much for the Wonderful recipe! I am new at pinterest, so I am hoping this works. The flour was listed twice on the recipe. Was that a type o or was that how much flour to actually use? Thanks. Haha. Well, I’m happy that everyone enjoyed them! And what a fun thing to bring for the school staff. :) Thank you so much for the feedback! Ooh, thank you! I know exactly what you mean. :) What a compliment! Great job with these! Super fun, and the strawberry jam sounds like the perfect dipper! Thanks! I loved it. Normally dip is full of weird ingredients… but not this one. Yay! Uuhh..spooky! But shortbread with strawberry jam sounds soo yummy! And I totally miss having those little vials for flavorings. I know they can be awkward to handle, but somehow they always bring up nostalgic childhood memories of Christmas cookie baking. They actually look delicious, weird as it may sound, lol. I love shortbread and almonds so this is a winner for me. And love the blood too! Haha. Thanks! Happy you think they look delicious. They at least taste that way! Oh my gosh, these are SO cool! I can't believe you made these, you are so talented!! Aww, man. Where were you and Loretta from above when I was making these?! You two are genius! Next time I'm definitely painting the nails and making boils. Yuck. These are awesome….they really look real with the strawberry jam :-) My kids would love them!! I bet you could make them even healthier and your kids would still love them! Wow, those do look nasty! It would be sweet if some of them had boils as well. Blah! I bet they taste great, though! OH NO! Boils! Nooooo. Why didn't I think of that?! You're genius. oh my gosh those look crazy real…lol that would be funny to eat. I think some people were so disgusted that they refused to eat them! These are so awesome Erin! I love how creepy they are! these are totally creeping me out!!! I LOVE THEM! so fun. I've never been prouder to creep people out! Thanks! I love your healthy makeover of these. Such a great Halloween treat. These are AwEsOmE!!! I love them… And using jam sounds soo much better than gel. I am glad you decided to post these. Plain awesomeness!!! :-D Happy Halloween! Oh my gosh these are adorable, I can't believe how real they look. 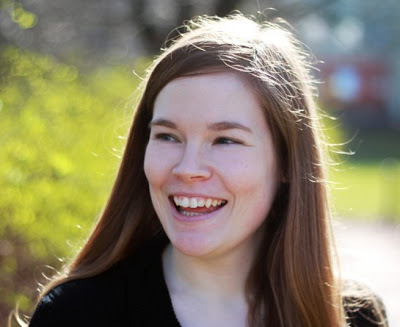 Amazing job, Erin!